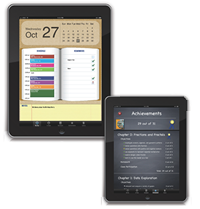 Saferock can bring your content to other digital channels, such as the iPad®, digital tablets, smart phones and e-readers. Using the one-to-one interactive nature of these devices, we help you create a compelling user experience that enhances your content. Saferock can help you design a strategy that will leverage your content across different media, thus extending the value of that content to your readers and to your company. By taking advantage of the inherent advantages that each media type offers, educational publishers can provide a rich learning platform. The text book can be used to study and learn material. This media provides in-depth learning materials for mastering a subject that is easy to use on a desktop. The interactive whiteboard provides teachers with the ability to engage students in learning experiences in the classroom with interactive exercises. Portable devices provide an engaging and convenient way for students to review their material and prepare for assessments. This multiple-channel approach is one of the strategies that we can help you develop. When we work with you, we’ll prepare a plan to take your existing content and repurpose it so that it meets your objectives for the one, three, and five year time frames.